Buoyed by several years of growing container traffic, terminal operators in the port of Montreal are expanding and upgrading their facilities to attract even more business. While final numbers for container traffic during 2015 haven’t been released by the Port, volumes surpassed the 1.4 million TEUs handled during 2014 as part of a record traffic year of cargo. This year will see the completion of the rebuilding of the Viau terminal into a container handling facility that Termont Montreal Inc. will operate, along with the Maisonneuve Terminal. Meanwhile Montreal Gateway Terminals, which operates the Cast and Racine Terminals served by five major container lines, has adopted a new terminal operating software system to optimize efficiency, heighten security and enhance customer service. MGT was acquired during the year by a Canadian consortium led by Fiera Axium Infrastructure Inc. When the terminal upgrades are complete, the Port anticipates being able to handle 2.1 million TEUs annually. “There’s a lot happening in the port,” Madeleine Paquin, President and CEO of Logistec Corp., said in an interview. The conversion of the Viau Terminal to containers from bulk products was a direct response to the growing container traffic from MSC and other shipping lines. At the same, facilities for handling bulk shipments are being shifted to other locations “so we can make better utilization of the space available to use on the waterfront. MSC wants to expand its container business outside of Europe and the Mediterranean.” That could bring additional traffic from China, India, Africa and Latin American to the port, she added. Andrew Chodos, President of Empire Stevedoring, said in an interview the container business has been “bright for the last couple of years and business has increased.” Even with the slowdown in the Western oilsands industry, “the Port’s prospects are good. “The terminal operators have invested in new equipment for handling containers and steel,” he said. “Shippers know their cargo gets the best damage-free handling here. That gives the port better reputation.” He also credited the work done by the Port to keep the truckers and railways that serve the facilities moving with as few delays as possible. Michael Fratianni, President and CEO of Montreal Gateway Terminals, said the selection of Navis as the supplier of replacement computer software to manage its facilities has enabled the company to better track all the cargo it’s handling at its terminals. “It has not only enabled us to immediately simplify MGT’s operational procedures, but is the springboard for future technological advances.” The new technology speeds up the entry of truckers in and out of the terminals as well as showing how long it takes for containers to be loaded or unloaded from trucks so improvements can be made. Fratianni also said the new owners of MGT have a long-term interest in the port and will be investing in projects that will improve its capacity and productivity. Fiera Axium is a Montreal-based portfolio management firm dedicated to generating long-term investment returns through investing in core infrastructure assets. Julian Dubreuil, General Manager of Logistec subsidiary Termont Terminal, said the development of the Viau Terminal for containers was essential because the Maisonneuve terminal “has been working at capacity for the last few years.” Two container cranes will be installed this year at the Viau Terminal to replace four temporary mobile cranes. They have been unloading containers since last summer even as the site was being prepared with land work and compaction, new asphalt and 7,000 feet of railway tracks. In its temporary setup, the site could handle 125,000 TEUs annually. When the work is complete, it will be capable of 350,000 TEUs. If the business justifies it, the capacity can be increased to 600,000 TEUs in a second phase of construction. In addition to traffic from MSC, it handles containers from OOCL and Hapag Lloyd. Paquin credits Sylvie Vachon, President and CEO of Montreal Port Authority, for getting CargoM up and running. “It’s doing a lot of interesting stuff.” It started in 2012 as a component of the economic development strategy of Greater Montreal and the Metropolitan Cluster of Logistics and Transportation in Montreal. 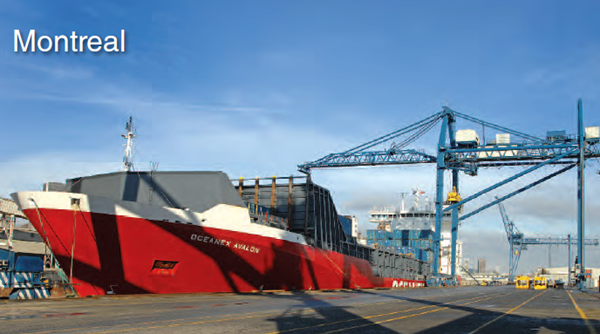 Its mission is to position the logistics and freight operations in the port “around common goals and concerted actions to increase cohesion, competitiveness, growth and expansion.” It also works on developmental projects to promote Montreal as a hub for transportation of goods, share best practices and technologies, harmonize and simplify regulations and attract and retain labor in different sectors of the industry. CargoM wants to make Montreal a port with an operational and environmental performance that others want to emulate while stimulating the economic development of the region it serves.